A mental health hospital for patients with autism and learning disabilities has been rated inadequate and placed in special measures. Care watchdog the Care Quality Commission (CQC) has taken the action against St Andrew’s Healthcare Nottinghamshire, based in Mansfield. The CQC’s rating of inadequate was the lowest possible rating. The watchdog found that the hospital did not always abide by the Mental Health Act code of practice on seclusion. Hospital staff did not always end seclusion at the earliest opportunity or complete observations correctly. Also, the CQC found gaps in seclusion reviews. The CQC said while some patients reported staff to be friendly, others suggested staff ignored, disrespected and punished them. Staff did not always respect dignity and privacy. Further, staff did not always respond to patients’ needs promptly. Staff used inappropriate and disrespectful language in a patient’s record. The hospital now has six months to improve or face closure, the CQC warns. Dr Paul Lelliott is the CQC’s deputy chief inspector of hospitals. Isabelle Garnett campaigned with husband Robin to get their teenage son Matthew out of another St Andrew’s-owned hospital in Northampton. The hospital featured in a Channel 4 Dispatches documentary. The programme highlighted how St Andrew’s subjected people with learning disabilities to face-down restraint 600 times in just six months. 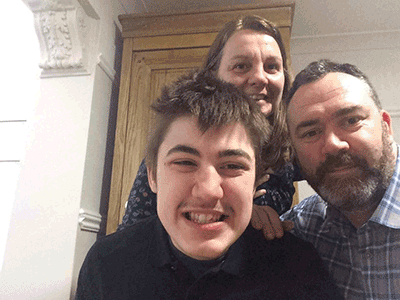 Matthew, 18, who has severe autism and ADHD, is now thriving in a residential setting. Autism consultant Garnett, 50, from London, said she was “not surprised” by the results of the CQC inspection. A spokesperson for St Andrew’s said they “deeply regret” care falling below “expected standards”. The hospital will “promptly address” the CQC’s concerns, added the spokesperson.